Note to self: Be careful of your hashtags and double entendres. Because regardless of what you intend, all it takes is a simple misinterpretation to get a completely different read on a situation, comment, or post. But I guess being a late 20-something, having three cookies on a plate, and the hashtag “cominginseptember” could be read differently and lead you to believe this post wasn’t about a new recipe. Despite the questionable math behind a June announcement for a September baby (isn’t there a rule about announcing in the 12-20 week range? ), there was at least one person who thought I was pregnant. If you know me, you are probably dying right now because you know where I stand on the babies/kiddos decision. It involves waiting. A while. A long while. At 28, the requests I get for custom cake orders have moved on from gender reveal cakes to smash cakes (if you need one, I got you! ), and my calendar is bursting with notifications to bring this friend a meal, go to that first birthday party, and attend another friend’s baby shower. This season is full of couples multiplying into families and babies growing into toddlers. It’s crazy, it’s joyful, and it’s exciting. But it is also interesting to be an outsider looking in, experiencing all of these life and family changes vicariously and not simultaneously. If you had asked me in my freshman or sophomore year of college what my life would look like 10 years later, I would have said something about staying at home and having children. Plural. But somewhere between being 18 and 22, the vision for my life changed, and God made me realize that going to school merely for an M.R.S. degree was not at all it. So here I am, with my only “kiddos” being the 81 boys who call me Mrs. Barrett and are in my care from 7:45-4:00 Monday through Friday. And I LOVE it. I love my boys, and I love my job. I also love my friends and their kids. I’m happy to hold their babies and wrangle their toddlers. Whew. That got deep real fast, and if you came here just for the cookies, thanks for sticking with me! Speaking of babies and cuteness, these little cookie cups are about to blow your mind and become your new favorite! 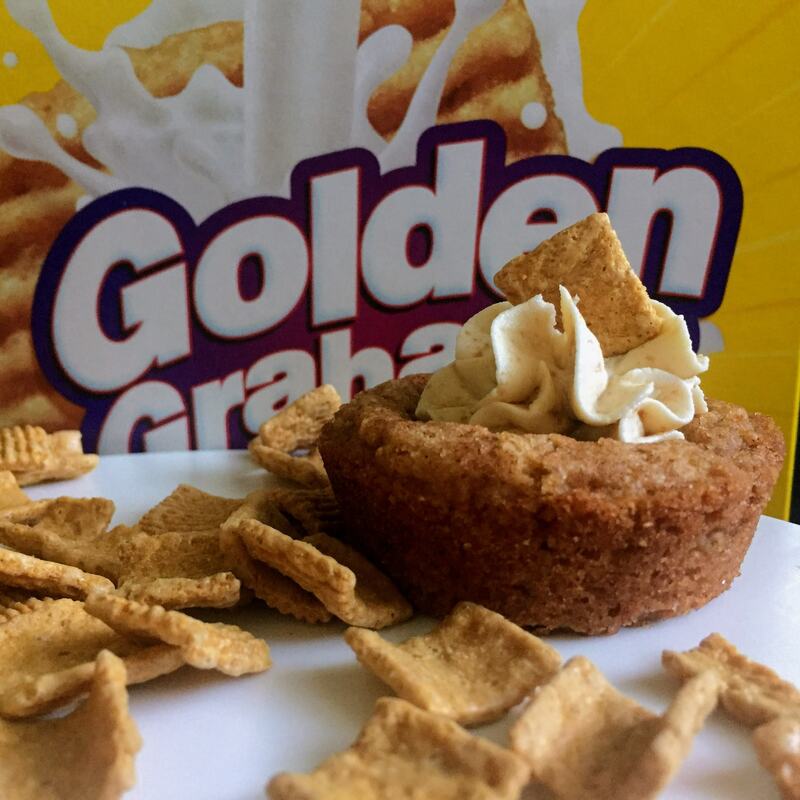 They’re a mashup of the classic snickerdoodle and one of my favorite childhood cereals, Golden Grahams. Growing up, we didn’t have snickerdoodles a whole lot (Mom wasn’t a huge fan, but I have vague memories of them on cookie trays at Christmas), and Golden Grahams were a treat (heyo parents against sugary cereal), but now I’m an adult and get to eat whatever I want! Ha! Cookies for breakfast! 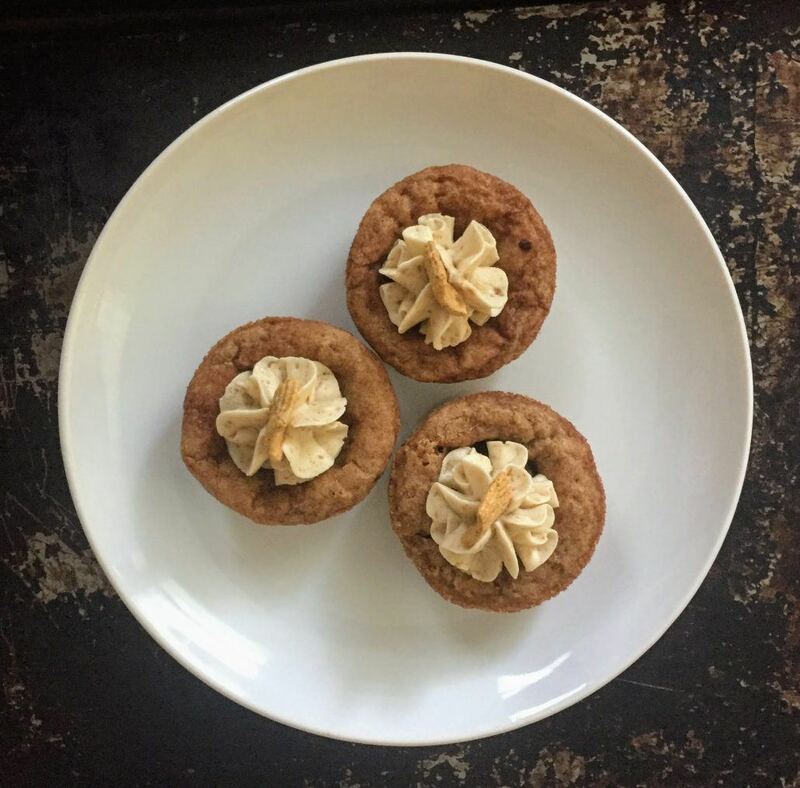 But seriously, I’ve jazzed up snickerdoodles before, but this time, we’ve got two extra twists going on: one, the cookie-baked-in-a-muffin-tin lends itself well to being a mini deep dish cookie. This makes a perfect canvas for twist number two, the frosting, which has crushed up Golden Graham in it. Dangerous stuff to have on hand, let me tell you what. I made these cookies for my coworkers as a test, and they got rave reviews, so much so that one of them requested them for her birthday! 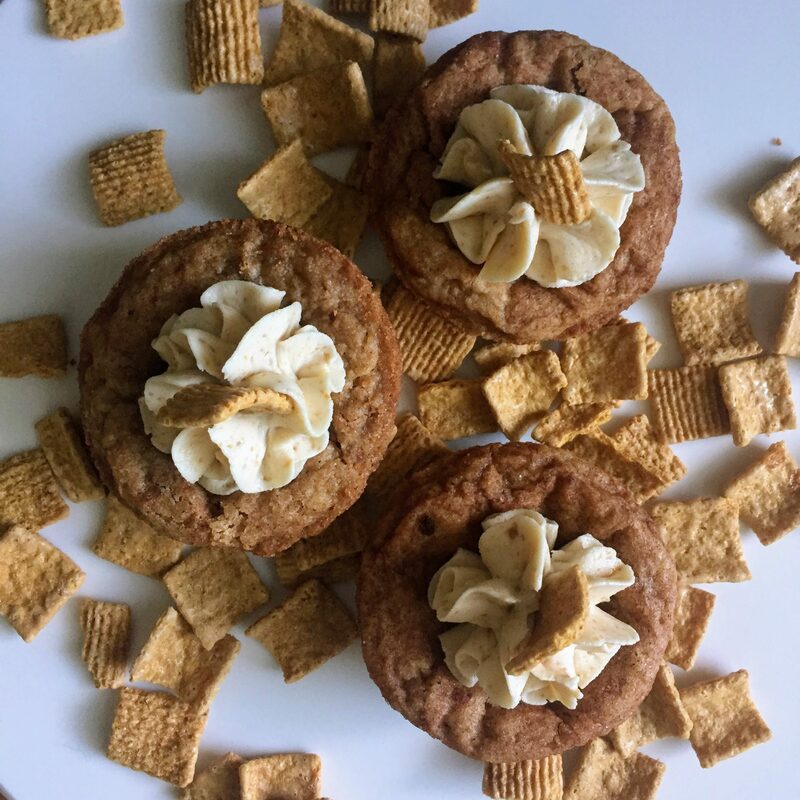 If Fruit Loops or cereal milk isn’t your thing, but you’re still looking for a cereal-themed treat, make these, and let me know how it goes! 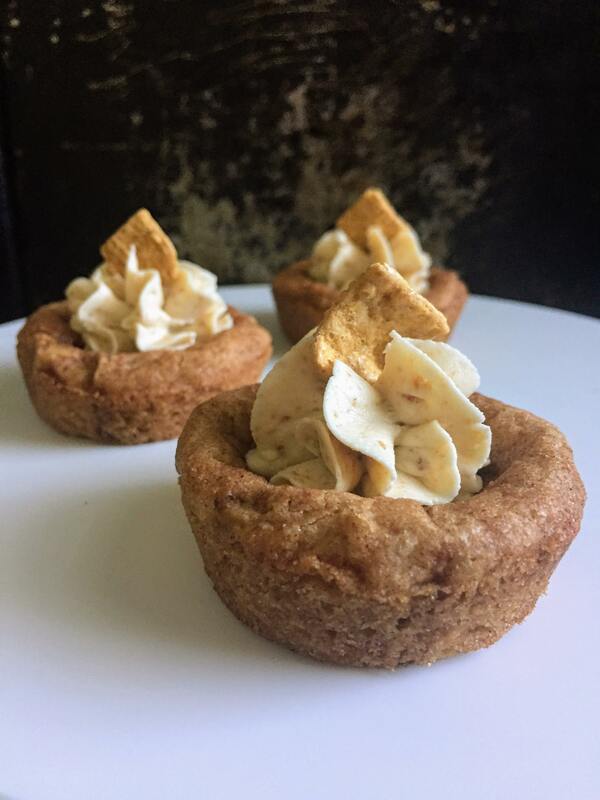 Snickerdoodle Cookie Cups with Golden Graham Frosting! 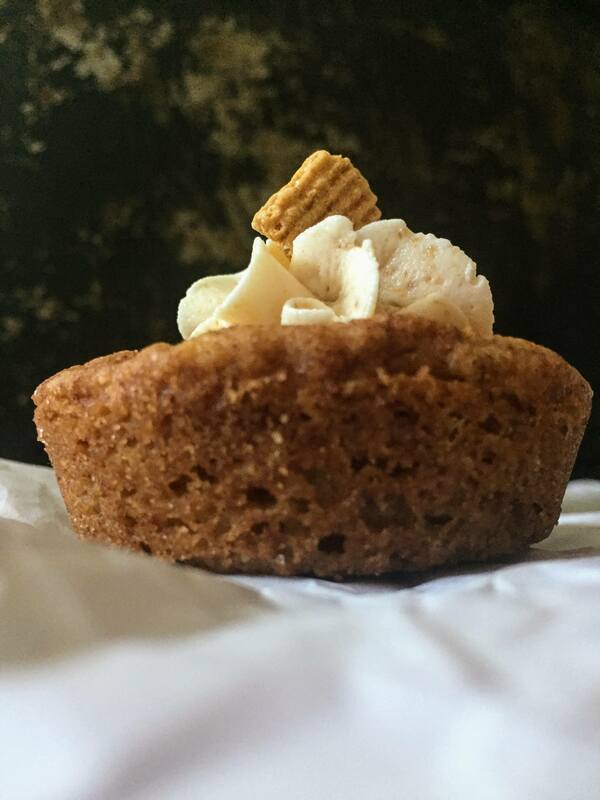 A cookie cup decked out in cinnamon and graham deliciousness! Preheat oven to 350 degrees. Spray with cooking spray or line two 12-count muffin tins with cupcake wrappers. Beat butter and brown sugar on medium high until light and fluffy, about 1.5-2 minutes. Beat in egg and vanilla, mixing on low speed until combined. Add baking powder, salt, 1 teaspoon of cinnamon, and half of the flour. Mix until combined, and then add the remaining flour. In a small bowl, combine the white sugar and cinnamon. Mix until combined. Roll the cookie dough into balls that contain about 2 tablespoons of dough. Before placing in the muffin tins, coat the dough balls in cinnamon sugar mixture. Distribute dough balls into muffin tins. Bake for 10-13 minutes at 350 degrees, turning at the 5 minute mark. Mine were done at 11:30. Allow the cookies to cool in the muffin tins for at least 10 minutes. Once completely cooled, pipe or spread frosting onto cookie cups. To make the frosting, cream the butter and powdered sugar together until smooth and fluffy, about 2-3 minutes. Add heavy cream if you'd like to alter the consistency (too thick); beat the frosting on high for 1-2 minutes if you\'d like the frosting to be fluffier. Once the frosting is your desired consistency, stir in the graham cracker crumbs.